Handmade United States Patriotic Decor | Creative Ideas from Sea to Shining Sea! There are thousands of wonderful things about this time of year, but one of my favorites is fireflies. I remember running around in our yard, filling up an empty mayonnaise jar until the jar glowed like a miniature night sky. I also loved celebrating July 4th. We packed a bucket of chicken for a picnic and watched the fireworks shoot off behind a lake. The reflection of them was just as pretty as the actual fireworks. I love making patriotic decor and I’ve been admiring some amazing handmade decor made by others, so I thought I’d share some of my favorite finds. Most of these products can be purchased and are very affordable, but many could be made as well. Many of these United States patriotic decor projects are from Etsy shops, so I hope you’ll visit their shops and hit the “favorite” button to show your appreciation for their work and creative ideas. I hope you enjoy this roundup of projects that celebrate the United States, from sea to shining sea! 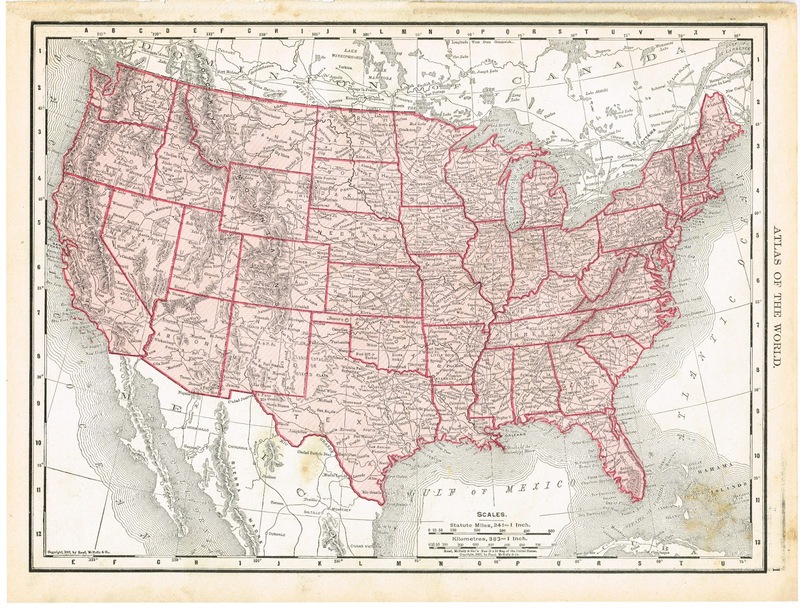 Let’s start off with some really easy decor – just print & frame this antique map from 1911.